As I’ve written in Solo by Choice and discussed at my blog, a well drafted, ethically compliant retainer agreement is a lawyer’s most important tool in guarding against grievances, setting client expectations and generally, helping to create a profitable pratice. Without a retainer, some bars won’t even let you collect your fee. And if your agreement doesn’t comply with bar rules, you may find yourself hit with a serious grievance. Finally, a retainer is the first document that a client receives from your office – and a professional, well thought out and thorough retainer can be a selling point for your practice. Because of its importance, retainer letter is one of the first documents that you should create for your office. You should constantly review and modify it to incorporate new ideas as you move forward. At the same time, there are no shortcuts: because law practices and bar rules are so divergent, it’s impossible to create a standard, one size fits all retainer. At Soloformania, I list some letters that may offer a starting point or include language that you want to put into your retainer agreement, but you’ll still have to do most of the modifications yourself. How can a retainer letter help you keep a fee? Because the agreement (if you choose) sets out what you’ll do in a case, you can readily defend your fee by simply pointing to a list of tasks in the retainer that you said might be necessary. For family law attorneys, Michael Sherman of Law for Profit.com has a great Sample Retainer (at the end of the materials) that you can modify for your jurisdiction. Notice that the retainer educates the client by giving a roadmap of the proceeding, establishes an expectation that the matter may potentially be protracted, makes clear the terms of payment, sets forth grounds for withdrawal and contains a sunset provision on the effectiveness of the agreement. Yes, there’s even more that you can include in a Retainer (or a supplemental Office Policies Guide) such as policies for use of email, document retention, data security, time for returning phone calls, resolving billing disputes, Client Bill of Rights or even green office practices. But Sherman’s retainer covers many bases for a family law practice. Don’t wait for your first client to walk through the door to draft a retainer agreement. 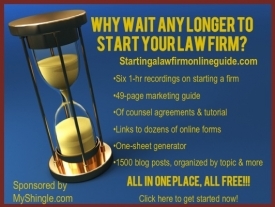 Get started now with this important building block for your law firm.